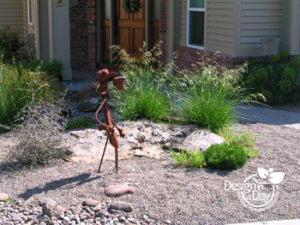 Drought tolerant Portland landscape design example. This front yard shown in winter is gravel, stone and plants. In recent years, droughts have made it harder to maintain your property’s landscaping, especially with water restrictions that make it almost impossible to maintain lush, green natural grass. While it may be tempting to throw up your hands and just let it go brown, you do have many other options for increasing your property’s eye appeal. Knowing about these four drought resistant landscaping ideas gives you the perfect starting point for transforming the look and usability of your lawn. This landscaping option requires no watering, and it can last for years. However, too much gravel and stone can look stark. There is also the risk of gravel and stone being displaced during times of heavy foot traffic or inclement weather. For this reason, it is best to limit the use of this ground covering to smaller accent areas. Filling in the area around a fire pit or lining a walkway with stones and pavers reduces the amount of grass you need to create a lovely outdoor space. Yet, you will still need to consider other options if you prefer some green in your landscaping plan. The new stairs are complemented by easy care artificial grass. Gravel and stone may do the trick, but they still lack the soothing quality of staring out at a lush, green space. Artificial grass is a great option when you prefer the look of natural blades since it has a similar appearance and texture, and it offers additional benefits for drought conditions such as requiring no water to maintain its look. You will also find that installing artificial grass eliminates the need for other forms of energy wasting such as mowing and weeding, and it lasts for years with little more than an occasional wash down with the hose. These hardy plants require very little watering to achieve gorgeous growth. While succulents are low-maintenance, it does take some know how for selecting the types that will work best in your climate. Therefore, you will want to do some research before planting to find the right mix of colors, textures and hardiness for your outdoor area. Hen and Chicks – Sempervivum and Sedum Spath ‘Voodoo’ are two popular options for adding succulents to drought-prone areas. Life in a drought state is hard for flower loving home owners. However, there are some options for brightening up your outdoor space even when the rain has yet to fall. 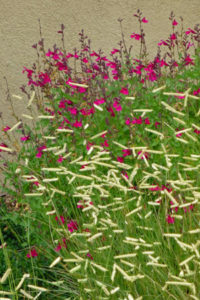 Consider adding low-water blooms such as Russian sage and lavender to your garden. Ideally, you should choose flowers that can be planted in pots so that you can keep them out of the heavy sun and put them out anytime that you need a splash of color for your décor. This option is a great way to add a touch of life by combining it with other ground coverings such as artificial grass. Keeping your landscaping in top condition may seem harder when you are dealing with drought conditions. However, water restrictions may be the impetus you need to explore other options that offer far greater benefits than natural grass. For best results, consider mixing it up a bit by adding a few succulents as accents to your artificial grass, or define a small space with gravel. By being willing to experiment, you will find the perfect design for transforming your lawn into a gorgeous oasis that frees you from the dreaded parts of regular lawn maintenance.